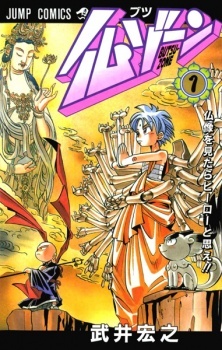 Of Shaman King fame, here's another series by Hiroyuki Takei about a Buddha with the 1,000 arms armor. Sennju, an emissary of the Buddha Kannon, appears in the human world to find and protect the reincarnation of the Buddha Mirokou. The emissary arrives on Earth just in time to save a young girl from being bullied by some rough looking men. Just who is this girl and will she believe that he's a Buddha who was sent by Kannon?